King's court ragdoll cats & kittens. Delightful, loving, kitties. 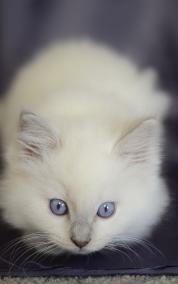 ~Ragdoll kittens are born white with their color and pattern starting to show around 10-14 days old. ~Ragdolls reach their full color and maturity between 2 and 3 years of age. 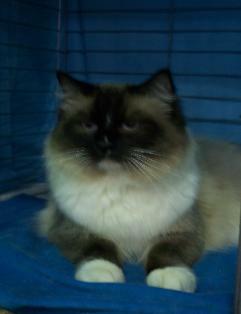 ~Ragdoll males can weigh 15-20 pounds and females 8-15 pounds. 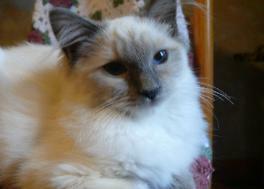 ~Ragdoll fur is rabbit-like in texture, medium to long in length, non-matting with little shedding. Minimal grooming is required. 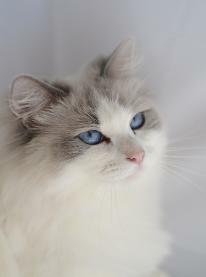 ~Ragdolls are all born with their beautiful blue eyes. 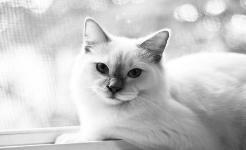 ~Ragdolls belong indoors as their docile, easy-going manner may attract danger from other animals as well as humans. ~Ragdolls are affectionate, love to be held and handled, and they have a quiet, sometimes interesting voice. in another room where their family is out of their sight. posts, etc. There are also Agility events at shows that they can be conditioned for! body color. They come in the standard colors of blue, lilac, seal and chocolate as well as the newer tortie, flame and cream. 1. Blue body color is ivory or bluish white with slate blue to silver gray points. 2. Lilac or frost body color is milky white with lilac or pinkish beige points. 3. Seal body color ranges from fawn to cream with deep seal brown points. 4. Chocolate body color is ivory or cream with points like milk chocolate. blue tortie with shades of gray and peach patches on an ivory body. A correctly marked tortie will have a split color face. 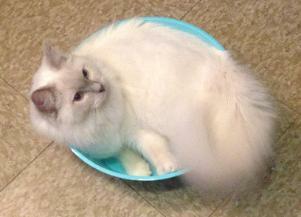 B. Flame point Ragdolls have a white to copper colored body with darker points. 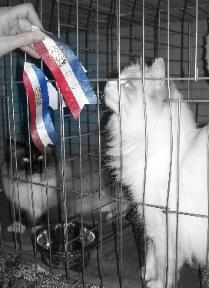 C. Cream Ragdolls will be white or ivory and their points will be cream to light peach in color. basic pattern but adds striping to the face, legs, tail and a contrasting white on the inside of the ears. darker mask on their face. They have white on their legs, feet, ruff and belly. Bicolors have a pink nose and pink paw pads. white boots on their hind legs. 3. 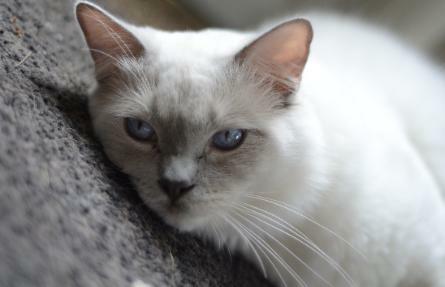 Colorpoint Ragdolls have darker color on their ears, face, legs, feet and tail. Their body color is lighter than their point color. Rochester, NY and just 2 hours west of Syracuse. No photo of my Opal yet! Amethyst. 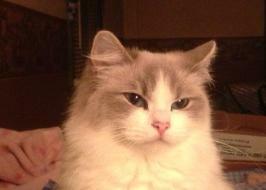 She is a Lilac Mitted. 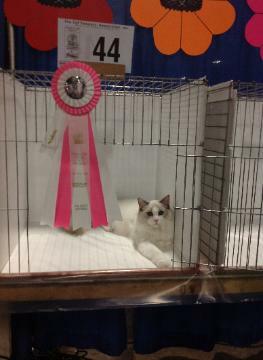 Bicolor from the Absolutdolls Cattery in Florida. temper as he is beautiful. Ch. 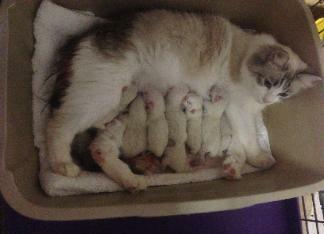 Rahabacat Boofalicious Diamond with her brood of 8!